The problem with hiring competent, principled attorneys is they don’t always tell you what you want to hear. That made Jack Goldsmith, briefly the assistant attorney general in charge of the Office of Legal Counsel, an inconvenient Bush administration appointee. His tale of bureaucratic and legal infighting is simultaneously interesting and important. Goldsmith’s appointment grew out of a disagreement between Attorney General John Ashcroft and White House Counsel Alberto Gonzales. They often clashed: Gonzales usually won, even though he was usually wrong. Explains Goldsmith, Gonzales “defeated Ashcroft’s effort to take a hard-line stance against affirmative action before the Supreme Court; he led the creation of military commissions, which Ashcroft never liked; and he put the brakes on Ashcroft’s attempt to implement an aggressive interpretation of gun rights under the Second Amendment.” They also battled over the FISA program, in which the attorney general turned out to be a defender of civil liberties. The OLC position became another battle. The White House wanted John Yoo, an OLC deputy, to head the office, which assesses the legality of presidential actions. Yoo authored many of the early opinions on torture and enemy combatants and was a strong advocate of the unitary executive  the view that, to paraphrase French King Louis XIV, the president is the state. Technically on Ashcroft’s staff, Yoo “took his instructions mainly from Gonzales, and he sometimes gave Gonzales opinions and verbal advice without fully running matters by the attorney general,” writes Goldsmith. So Ashcroft said no to Yoo. Goldsmith, special counsel to the general counsel at the Defense Department, became the compromise choice. "We did not, however, talk about things I didn’t know about at the time, such as the National Security Agency’s Terrorist Surveillance Program, or what President Bush would later describe as the CIA’s ‘tough’ interrogation regime. Nor did we talk about my disagreements with administration policy  disagreements that [his Pentagon boss, Jim] Haynes knew about but apparently did not convey to the White House. While I believed the government could detain enemy combatants, I thought it needed more elaborate procedures for identifying and detaining them, and had been working on this issue since I arrived at the Pentagon. I had long argued to Haynes that the administration should embrace rather than resist judicial review of its wartime legal policy decisions. I could not understand why the administration failed to work with a Congress controlled by its own party to put all of its anti-terrorism policies on a sounder legal footing." President Bill Clinton also made expansive claims of executive power, observes Goldsmith. However, this administration has pushed much further. The terrorist attacks of 9/11 triggered a demand for ever more expansive authority without accountability, and the OLC was expected to provide the necessary legal justification. "I was briefed on some of the most sensitive counterterrorism operations in the government. Each of these operations was supported by OLC opinions written by my predecessors. As I absorbed the opinions, I concluded that some were deeply flawed: sloppily reasoned, overbroad, and incautious in asserting extraordinary constitutional authorities on behalf of the president. I was astonished, and immensely worried, to discover that some of our most important counterterrorism policies rested on a severely damaged legal foundation. It began to dawn on me that I could not  as I thought I would eventually be asked to do  stand by or reaffirm these opinions." It would be difficult to rethink prior opinions on such issues in a normal administration. Doing so in this government was particularly hard. Although he backed the administration’s legal position  he devotes a chapter to the question of enemy combatants and military commissions  he believed the administration’s policy “was excessively legalistic, because it often substituted legal analysis for political judgment, and because it was too committed to expanding the president’s constitutional power.” Administration officials believed that “cooperation and compromise signaled weakness and emboldened the enemies of America and the executive branch.” (Some probably hated the latter more than the former.) Ironically, he concludes, the administration’s policies have made Congress and the courts more suspicious of executive power and more willing to constrain the president. However, torture is the issue that ended Goldsmith’s OLC tenure. He concluded that two Yoo opinions concerning interrogation were erroneous. The documents, he writes, were “legally flawed, tendentious in substance and tone, and overbroad and thus largely unnecessary.” To some they appeared to be works more of political than legal scholarship. But withdrawing the legal authorization for what can fairly be called torture put interrogators, who had been relying on their government’s promise that their tactics were legal, in an extraordinarily difficult position. Attorney General Ashcroft accepted Goldsmith’s opinion with grace; the White House was more grudging. Goldsmith asks how the OLC could have issued opinions that “made it seem as though the administration was giving official sanction to torture, and brought such dishonor on the United States, the Bush administration, the Department of Justice, and the CIA?” He answers: fear. 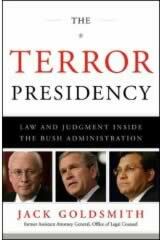 Out of fear of future terrorist attacks, the “OLC took shortcuts in its opinion-writing procedures,” shortcuts undoubtedly encouraged by the sustained push for increased presidential powers. Goldsmith chose this time to resign. He had the usual personal reasons, but, he notes, “important people inside the administration had come to question my fortitude for the job, and my reliability.” That is, his reliability to protect the administration from the Constitution. "The Terror Presidency’s most fundamental challenge is to establish adequate trust with the American people to enable the president to take the steps needed to fight an enemy that the public does not see and in some respects cannot comprehend. This is an enormously difficult task. The Terror President must educate the public about the threat without unduly scaring it. He must persuade the public of the need for appropriate steps to check the threat, explain his inevitable mistakes, and act with good judgment if an attack comes. And he must convince the public that he is acting in good faith to protect us and is not acting at our expense to enhance or protect himself." Sadly, the contrast between Goldsmith’s “Terror President” and George W. Bush could not be greater.